Mayor Mike Duggan is celebrating a major milestone in Detroit's efforts to fight blight today. Early Tuesday morning, crews began tearing down an abandoned home on Marlowe street on the city's east side. Using Facebook Live, the mayor showed his social media prowess allowed the masses to tune in a watch the "celebration" which gathered numerous community leaders, including District 1 Manager Stephanie Young, who offered a short speech in the beginning of the stream. "It's been a long time coming for Mr. Jones and his wife across the street, they've labored long and so we said we were coming and we've kept our promise," Young said. Mayor Duggan praised demolition teams and the Detroit Land Bank, and rattled off some stats including that Detroit has done 5,000 demolitions in 2016 and plans to do 6,000 in 2017. "It's been an incredible learning process but nobody in America has begun to try and address blight at the rate we have," Duggan said. "Every time one of these houses goes down, we raise the quality of life for everybody else in the neighborhood. 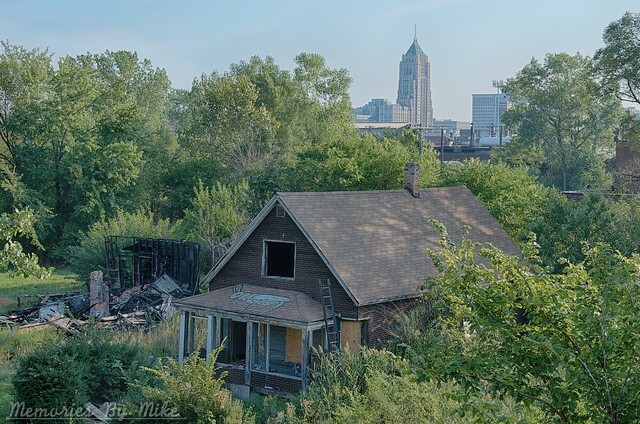 Look here, the beautiful houses, the families across the street, these are folks who stayed in this city, paid their taxes, kept their houses up and had to watch the blight spread," he said. "We're finally starting to fight it effectively." You can check out the festivities below.